Our magnificent Phragmipedium caudatum would have attracted far more admirers were it not for the raspberry kovachii flowering simultaneously on the waterfall. The lucky visitors who managed to tear themselves away and explore the back of the High Elevation House found this beauty overlooking the Sun Pitchers (Heliamphora) and bromeliads. 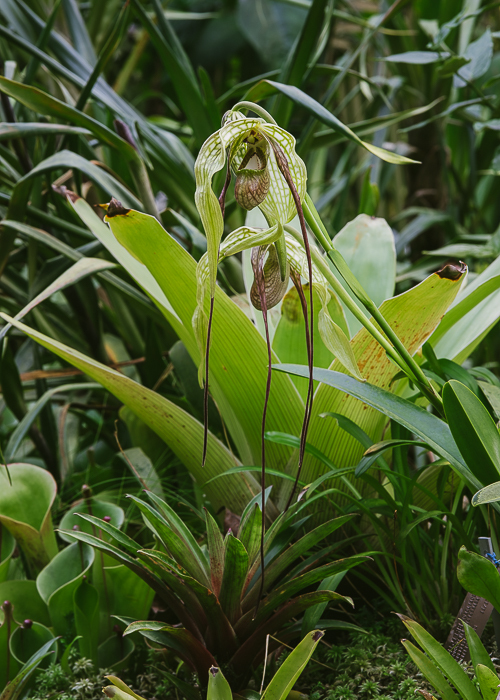 The markings on the oversized drooping sepals of Phragmipedium caudatum remind me of fenestrations, the translucent 'windows' characteristic of the pitchers of Nepenthes aristolochiodes, Sarracenia psittacina, and the flowers of Bulbophyllum grandiflorum. Fenestrations are thin parts of the leaf or flower that allow light to be seen by an insect trapped in the interior, but aren't actual exits. In carnivorous plants, the insect flies into the 'windows' in the leaves over and over until it tires and slides into the liquid below. Fenestrations in a flower direct the pollinator toward the anther and stigma, but I don't know if the markings on Phragmipedium caudatum function in this way. Phragmipedium caudatum grows on rocky seepage slopes at 1,500 to 2,000 meters elevation from southern Mexico to Peru. Our plant is embedded in live sphagnum on a large granite rock in the High Elevation House where it receives a 75º daytime maximum temperature and a 52º nighttime minimum. This week, it has three flowers open simultaneously.